Peel and pit the Peaches; cut in half then slice into ¼” slices. Place in a large mixing bowl; sprinkle with the Lemon Juice, then gently combine with the Sugar, Cornstarch, Cinnamon and Nutmg. Roll out half the Pastry and line a 9” pie pan, allowing the dough to hang over the sides. Fill the pastry with the Peaches, and then roll out the other half of the dough. 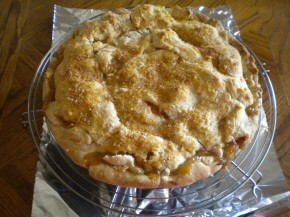 Fit over the top, trim and crimp the edges; slash the top crust to allow for steam venting. Bake at 450 degrees for 15 minutes on bottom oven rack; lower oven to 375 degrees and move pie to middle of oven. Bake another 15 minutes. Brush top crust with beaten egg; sprinkle with coarse sugar if desired, then bake for another 15 minutes or until the crust is golden brown.